When you come to Directory Opus, the word script may cause some confusion because Opus has several kinds of scripts. ✱ On another page, we look at rename scripts, which give you fine-grain control over renaming operations. ✱ On another page, we look at script add-ins, which let you reach deep into Opus functionality, allowing you for instance to create custom columns or define what happens when you double-click a blank area of a lister. ✱ This page aims to introduce you to script functions, which can power the behavior of a button or keyboard shortcut. In my view, the best way to get started with writing script functions for Opus buttons is to look at some barebone scripts. This is the time-honored Hello, World! tradition. Once you have some simple near-empty "shells" in your hand, you can build them up to make them perform more complex tasks. In the case of Opus, having these hollow "shells" in your hand at the outset seems all the more important to me since each script requires a bit of scaffolding, i.e. lines of codes which are necessary for everything to work but whose deeper workings you may not need to master. The scaffolding is the proverbial forest which may prevent you from seeing the trees—the trees being the actual functionality you want the script to perform. Or maybe the scaffolding is the fence around the forest. I don't know. It doesn't matter. I'm sure you got the point, so let's keep going. 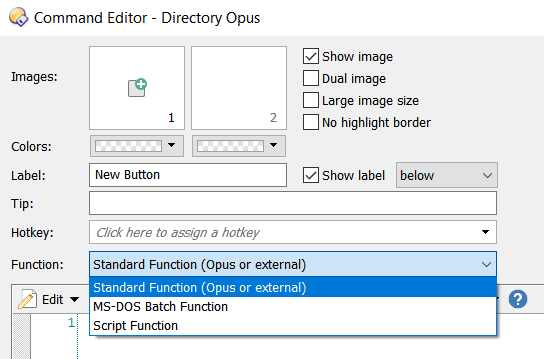 This page is going to assume that you know very little Opus, so it will quickly explain how to create and edit a button, which will be basic for most of you. But it will assume that you know some coding, and in particular that you are familiar with at least one C-style language such as Java, C# or PHP. In this section we get right to the point where we can start writing code. For many of you, the information will be old news, but I want to make sure that anyone who reads this page has everything they need to get started. Before we get started, please do me a favor and set this preference in Opus so that you and I speak the same language. You can always unset it later on if you don't like it. With this preference set, when you Alt-Click a button on the toolbar (i.e. hold down Alt and click with the left button), Opus takes you right to the Edit dialog for that button. And when you Alt-Click an empty space on the toolbar, Opus enters the toolbar customizing mode. Let's create a new button so we can place a script inside of it. To make the button easy to tweak, at first we'll place it on one of the toolbars where, to make changes, all we'll need to do is Alt-Click it. When you're done creating buttons, if you only want to use them via their hotkeys, you can move them into deep submenus, away from the main interface—or turn them into standalone hotkeys. ✱ Alt-click an empty space on any toolbar. If you followed step 1 above, Opus enters the toolbar customizing mode. Double-click the new button. The button edit dialog opens. The basic version of this dialog allows you to create a traditional button that uses the built-in Opus command language. To create a scripted button instead (our goal with this page), press Advanced now. In the advanced command editor, go straight to the Function pull-down and select Script Function. At this stage let me explain a bit what that pull-down menu does. If you don't care, just skip the next paragraph. The Advanced mode is for three types of buttons: (i) the kind of scripted button this page is about, (ii) DOS batch commands, and (iii) regular Opus commands that may require more than one line. You choose between these three types of buttons in the Function pulldown. Since Advanced mode allows you to create every kind of button, consider setting it as a default. To do so, open Preferences, paste button_editor_advanced in the search box at the bottom left, and double-click the entry to set its value to True. Okay, you've selected Script Function in the Function pull-down menu, right? At this stage, the command editor shows you three tabs: Modifiers, Script Code and Resources. The Script Code tab is selected. At some stage in your learning journey you may want to study the default code and comments that now appear in the button's editor section, but for a gentle introduction it may be a bit overwhelming, which is why I'll soon have you replace all of that sample code with the code of the barebone scripts below. Under Script Type, note that you can choose a language for the script. By default the pulldown shows JScript and VBScript, but you can use other scripting languages too. If you play with scripted buttons, in the documentation you will soon come across mentions that other scripting languages, such as Python, can be used. Even if you are a Python pro, resist the urge to try to write your Opus scripts in Python. It's not worth it. I love Python and have written programs whose printouts exceed a hundred pages, but I've come to accept that the most sane option for Opus scripting is JScript (followed by VBScript). This is because JScript and VBScript work out of the box on any Windows machine. To get Python to work requires a lot of fiddling. And if you succeed, you'll have something that works on that particular machine, but not on your other machines. Apart from that, if you use Python to script Opus, you are unlikely to get helpful answers on the forum. Most Opus scripters use JScript, so that's where you'll get the most help, and for me that's the number one reason to use JScript. Some people (fewer) use VBScript, so that's another option if you're fluent in VBScript. On this page, we'll only use JScript. To finish setting up the button, you'll have to click OK twice. The first OK takes you out of the Command Editor window. The second OK button appears on the Customize window. If that window isn't right there after you click the first OK, look for it on your Windows taskbar. You should now have a new button on your toolbar. ✱ Click the button: nothing happens. That's normal, the code inside the button is just general scaffolding. ✱ Alt-Click the button: this takes you directly to the Script Code tab, where you can tweak to your heart's content. Viewed a certain way, the work of creating and tweaking a script button merely consists in replacing the code that appears in the Script Code tab. In my view, your preferred workflow should be to write the JScript code in a code-aware editor, then to paste that code into the Script Code tab. Apart from having access to advanced editing functions, one benefit is that this protects you from accidentally losing your code, which is easy to do if it only lives inside the button. Keeping your code outside of Opus also allows you to use git or other version control tools to manage your scripts. I tend to use an IDE called WebStorm (that's what's on the picture) because I like JetBrains products, but you don't need an IDE—all you need is an advanced text editor, such as EditPad Pro (my favorite) or NotePad++ (the freeware favorite). That being said, if you're adventurous and insist on editing your script straight in the built-in editor, make sure you save your button often, and have a look at the Run button (mentioned in the Additional Tips section). From this point forward, I will present three small but functioning scripts which you can directly paste into the button we created in the previous section. The idea is not just to copy and paste, but to provide you with a crash-course in scripted buttons. How to learn from these scripts? ✱ Examine the scripts in the order presented. ✱ Read the scripts from top to bottom. They are self-documenting, so you shouldn't have trouble reading them—I've assumed that you know nothing about Opus scripting. ✱ Perform basic tweaks based on the syntax you immediately understand, for instance playing with the logic or the literals. ✱ Perform deeper tweaks by diving into the classes and methods Opus makes available to you. ✱ Use a script as a template to start your own script. It's always helpful to start from a working point. Although I'm calling this script Hello, World, it does a bit more than your single-message program. The script plays with several ways that Opus scripts can show you information: alerts, dialogs and the "Other Logs" utility panel. So doing, it introduces you to the important Func object. ✱ Alt-click the button, paste the code, click OK twice. ✱ Click the button. Note the two messages: a pop-up alert, and a message inside the Utility Panel. ✱ Click OK on the "Hello, World!" dialog. ✱ Click through the next dialog. The Func object is probably your first entry key into the methods and properties Opus makes available to you. Here is a link to online documentation for Func in DO12. You can learn a lot by drilling into the tree of methods and attributes. Since you may be using a different Opus version, you may like to see the documentation for your version. In Opus, press F1, select the Index tab, type fu, and select Func from the list. This script shows you how to start interacting with files in the Opus lister panes. If files are selected, when you click the button, the names of the files are shown in the Other Logs utility panel. In addition, if more than five files are selected, a dialog appears telling you that only the first five will be shown. The script introduces you to the important Tab object and shows you how to iterate through files. The Tab object is your main key to the listers. Here is a link to online documentation for Tab in DO12. You can learn a lot by drilling into the tree of methods and attributes. Since you may be using a different Opus version, you may like to see the documentation for your version. In Opus, press F1, select the Index tab, type t, and select Tab from the list. This script plays with files. What if you also want to enumerate selected folders? This script introduces you to file manipulation, leading up to a powerful custom renaming operation. Note that Opus also offers a dedicated type of script just for file renaming (this site has a page just about rename scripts). What makes this particular script powerful is that in traditional rename scripting, file names are considered one by one, whereas here, a file's final name depends on all the files being considered. ✱ In its simplest form, the script outputs a list of the selected file names sorted in a custom order: the length of the file's name, and, secondarily, the name itself in reverse order. ✱ If you uncomment one of the lines, the files are also renamed. ✱ To rename files, we learn about the Command object. Create files with the names below. The Command object is your main key to operating on files and manipulating the listers. Here is a link to online documentation for Command in DO12. You can learn a lot by drilling into the tree of methods and attributes. Since you may be using a different Opus version, you may like to see the documentation for your version. In Opus, press F1, select the Index tab, type comm, and select Command from the list. To deepen your understanding of script functions, I recommend you explore scripts in the Scripts section of the Opus forum. There are many wonderful examples contributed by the community. If you are overwhelmed by the choice, I suggest the following script because, having written it, I am intimate with it. It is no indicator of power or quality—there are far more complex scripts on the forum. Opus has some built-in facilities for buttons that quickly toggle between two states. In my view, this button is interesting in that it is a simple example that demonstrates how you can cycle between multiple states (not just two). Here are some additional tips which you may want to consider when working with scripted functions. Try exiting and restarting Opus via Help / Exit Directory Opus if you're using my toolbars, or File / Exit Directory Opus on the standard toolbars. Sad to say, but I often have to kill Opus manually via my task manager. I use Process Hacker, but any task manager (including the Windows default) should do. Incidentally, the CPU meter of your task manager might alert you to endless loops. Earlier, I mentioned that my preferred workflow is to edit scripts in a standalone IDE or editor, then to paste the entire code in the Opus button. However, there may be times when you want to tweak buttons directly within the Opus button editor—perhaps for quick debugging or testing. In those situations, the Run button at the bottom left of the script editor comes in handy as it lets you test the script without going in and out of Customize mode. When you create a new scripted function, Opus supplies some vanilla code and comments. You may like to replace that default with something you've worked with and fully understood, such as one of the barebones scripts on this page, or, better, one of our own, with helpful comments to remind you of features you'd like to remember. This can be done directly in the script editor via the Default pulldown. ✱ The Buttons / Scripts section of the forum. If you're more into VBScript than JScript, here are a couple of useful examples. ✱ Merge Folders. This script by Leo allows you to select multiple folders and merge them to a single folder, whose name you specify. You could accomplish the same in Flat view, but that would be more fiddly. On my toolbars, this button lives under Folder / Merge Folders. ✱ Paste Empty File & Folder List. This script by Leo allows you to copy a list of file names from a file or a web page and to paste them in a lister, which creates empty files bearing these names. File names that terminate with a \ are pasted as folders. On my toolbars, this button lives under Copy / Paste File & Folder List.